Leaving my apartment, prettily perched on one of the seven hills overlooking the city, I steadily zig-zagged down cobblestone streets in the Portuguese capital of Lisbon, heading in the direction of Old Town in the valley below. I didn’t know specifically where I was, but it didn’t matter, since I was following the locals and it was all downhill. Intermittently, I caught colorful glimpses of the glittering port around one corner, and centuries-old buildings around another corner, until I rounded one acute bend that took my breath away, stopping me mid-step. The incredible panoramic cityscape overlooking Old Town briefly gave pause and then spurred me onward in anticipation of what adventure awaited below. I prefer to travel solo—especially when adventuring as a digital nomad. As a freelance web writer, there’s no need to ask for days off from work and I’m free to schedule travel for as long as I want and where I want. Moreover, going solo always opens the door to different, more immersive, experiences that I wouldn’t have if I were with travel companions. In Old Town, pedestrianized streets cut a wide swath through downtown. There you’ll find traditional handmade items, upscale clothing stores, local art studios, crafted pottery and linens. Wherever you look (day or night), rows of outdoor cafés, taverns, specialty coffee shops, fancy patisseries, food vendors, and street performers greet and entertain waves of both locals and tourists. 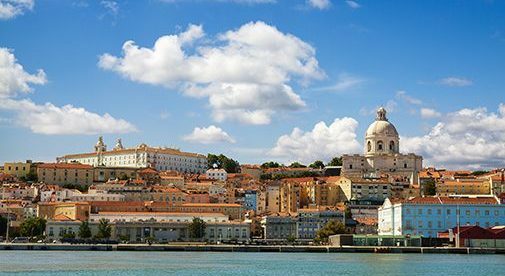 Thanks to the city’s storied past, Lisbon boasts a melting pot treasure chest of unique historical monuments and other famous edifices throughout the mystical city. No surprise that Lisbon is a favorite “office away” choice for many digital nomads. With its unique beauty, rich culture, incredible heritage, old-fashioned hospitality, laidback attitude, mild weather, and the fact that it’s one of the most affordable spots in Europe, it’s tough to beat for an enjoyable, work-away adventure. A fascinating discovery opportunity is to explore the city via narrow cobblestone streets, while riding on old-fashioned trams winding past decorative pastel-colored buildings through centuries-old neighborhoods bursting with character. Lisbon is also an ideal home base from which you can visit world-renowned attractions around the city and beyond. Just 30 minutes away by shuttle train are you’ll find beautiful beaches and two of Lisbon’s UNESCO World Heritage sites—the Mosteiro dos Jeronimos (Monastery of Jerónimos) and the Torre de Belem (a fortified tower from the 16th century). With so much to see and do in Portugal‘s intriguing capital and surroundings, it’s a great environment for living an exciting and successful work-life balance as a digital nomad. Your office can either be your apartment, one of the co-share work places throughout the city, or at a café with WiFi and a scenic view. When I’m researching a dream digital nomad destination, I create a checklist of the things I’m looking for. I want to be able to walk the city or have access to good transportation, for sightseeing and grocery shopping; rent a city-center apartment with reliable WiFi and kitchenette; stay within budget (traveling in low season and staying weeks or months at a time can dramatically lower costs); find social outlets (like co-share spaces, outdoor cafés, libraries, or expat groups); and enjoy a stimulating work and play environment with plenty of opportunity for day trip and side trips. Lisbon exceeded my expectations. Other favorite cities for traveling as a solo female digital nomad include: Madrid, Barcelona, Paris, Nice, Antibes, Florence, Lucca, Pisa, Rome, and Porto. With my portable income…I get to enjoy them all.